In stock -This product will ship today if ordered within the next 2 hours and 57 minutes. This refreshing conditioner is a blend of jojoba and seaweed with panthenol (pro-vitamin B5) known for its rejuvenating qualities, wakey wakey! 100% natural fragrance, with essential oils. Free from parabens and SLS. Faith in Nature believe in doing good for their customers as well as the planet. They are passionate about keeping their prices affordable and believe that using natural, cruelty-free sources is what makes their products work so beautifully. Aqua, Cetearyl alcohol, Brassica campestris seed oil, Simmondsia chinensis seed oil, Panthenol, Citrus aurantium dulcis peel oil, Cananga odorata flower oil, Melaleuca alternifolia leaf oil, Ascophyllum nodosum powder, Cetrimonium chloride, Tocopherol, Helianthus annuus seed oil, Sodium benzoate , Potassium Sorbate, Citric acid, Limonene. Rinse well and massage gently into wet hair. For best results, leave on for 5 minutes. Rinse thoroughly. 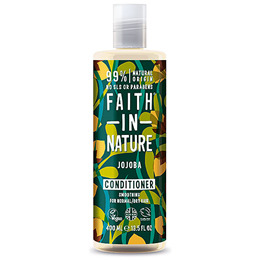 Below are reviews of Faith in Nature Jojoba Conditioner - 400ml by bodykind customers. If you have tried this product we'd love to hear what you think so please leave a review. 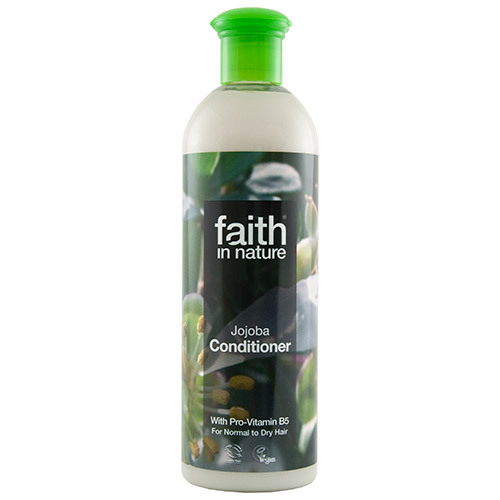 For a more natural conditioner the faith in nature range are brilliant, do the job. Obviously you can’t beat salon stuff for making your hair look fab, but they’re full of bad chemicals, so this is great for a range without all the rubbish in. I’d prefer to have less plastic packaging from the brand, but what can you do?! Lovely conditioner, perhaps very light. But leaves the hair soft and silky. Good for frequent use. Absolutely gorgeous conditioner (I've been using it with the Jojoba shampoo), it feels like silk when you rinse it out and leaves the hair feeling very soft and nice - it's improved my frizz considerably. Love it!